Anthony Brown, a Delaware county native, started his martial arts career here at Algeo MMA a few years ago. He picked up Brazilian Jiu Jitsu and never looked back. He began his career with zero martial arts experience and worked his way up to his goal of becoming an instructor. Receiving his blue belt in BJJ has been one of the most satisfying accomplishments of his life. He has competed in numerous jiu jitsu tournaments has proudly stood on the medal podium in four out of his five tournaments. Prior to training BJJ, Anthony Brown was and still is an elementary school teacher in Norristown, Pa and a graduate of Penn State University. In addition, he is currently finishing up his master’s degree in education at Cabrini University. 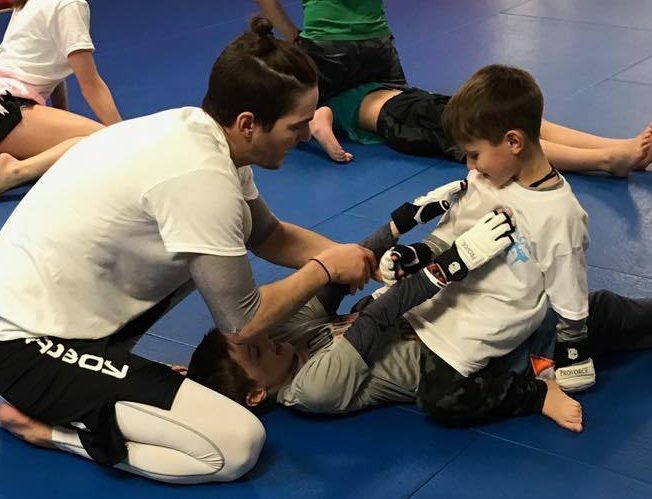 As one of the kids MMA instructors, Anthony Brown brings years of experience working with children to the program and demonstrates the patients and love of working with children and watching them grow into successful adults. To instill the 5 core values of our Kids Martial Arts program(Focus, Discipline, Fitness, Confidence, Respect) into as many children as possible. I believe no child should have to fear going to school, the bus, or anywhere because of bullying. I plan on helping every student as much as I can to become bully-proof and more confident in themselves. Have Your Child Become Bully-proofed Today!